Last fall we meet with a couple from the Lazybrook/Timbergrove area of Houston. The homes in this area are all low-slung ranch homes with brick and wood siding. Most of the houses have fairly large yards with mature trees. 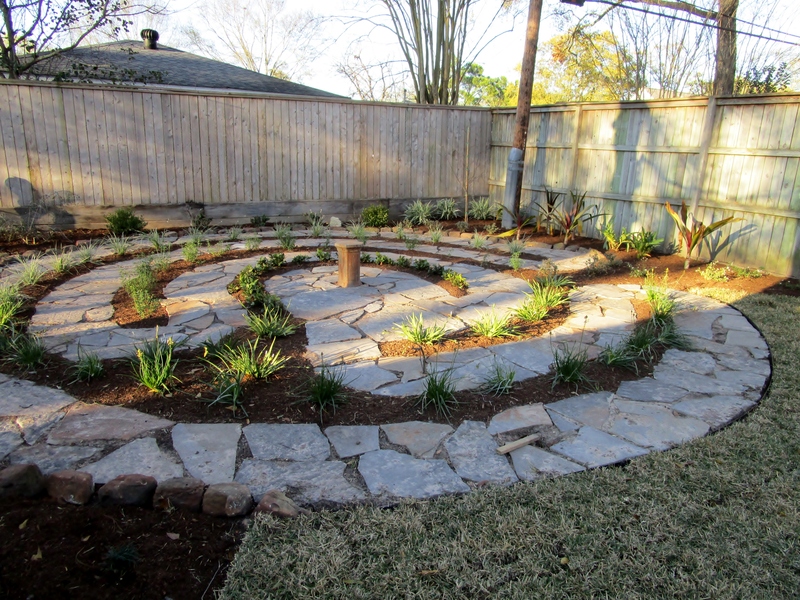 The owners wanted to refresh their backyard and add a labyrinth. 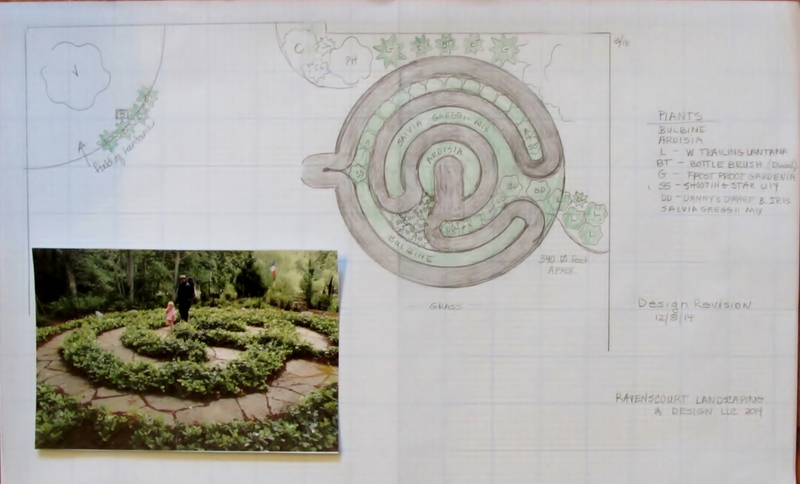 I am fascinated by labyrinths and was excited by the challenge of designing one for them. The rest of the garden was to be low maintenance but attractive when viewed from the kitchen window. 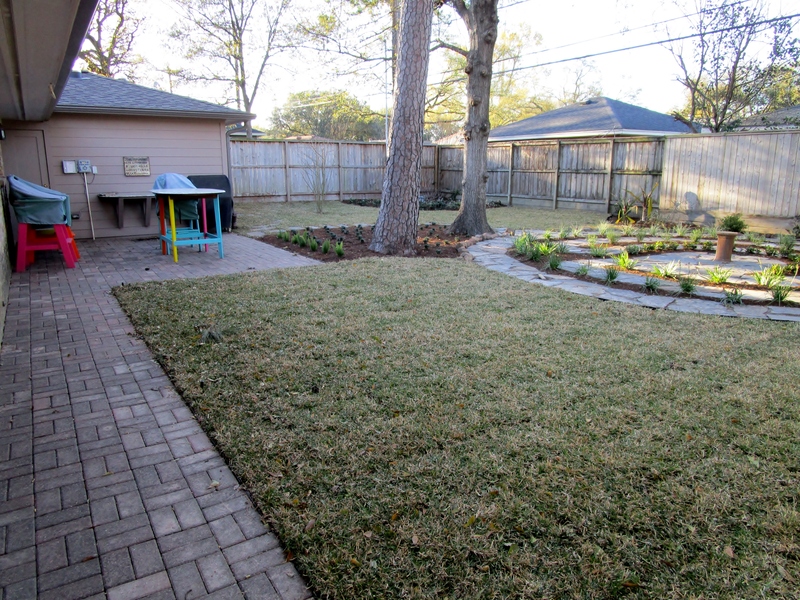 We also installed an irrigation system, drainage, put in new lawn and expanded and modified the paver patio. Below are a couple of before shots. Before shot of the corner where the labyrinth will be constructed. 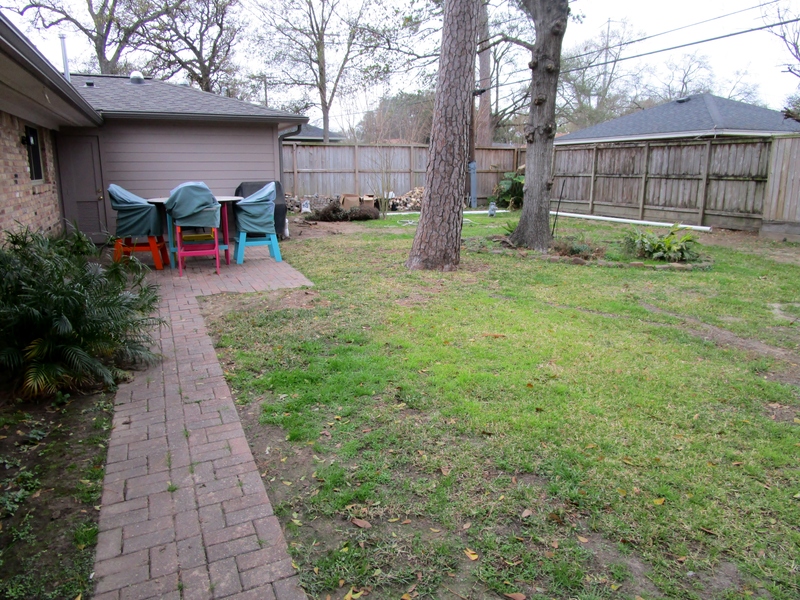 The patio was too small for the table set, so we widened the patio northward to the end of the house. Additionally the path was being overtaken by the palm; we moved the path closer to the house (under the eave) so that the compost pile can be accessed while still having cover from the rain. I started by doing a bit of research and collecting information and ideas. I stored them on a new board I created on Pinterest called Labyrinth. If you like labyrinths you will enjoy the pictures and information I have collected there. I began playing with the layout on paper. Getting the scale right was important. I have seen the labyrinth in the Cathedral in Chartres France and was fortunate that it was not obscured by chairs the day I was there. 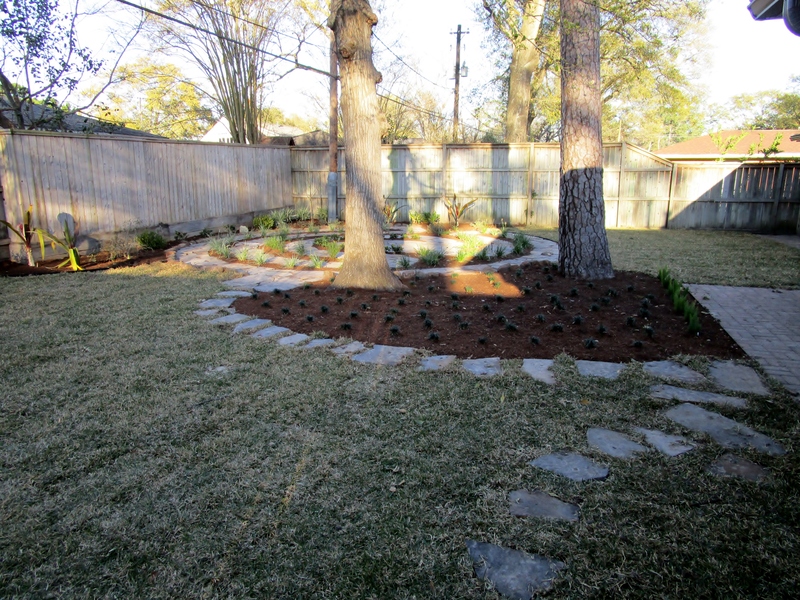 The space I was working with needed a much simpler design in order to incorporate planting beds. It is important to note a labyrinth is different than a maze and has only one path leading to the center and back out again. It should be easy to follow so your mind can relax and meditate. 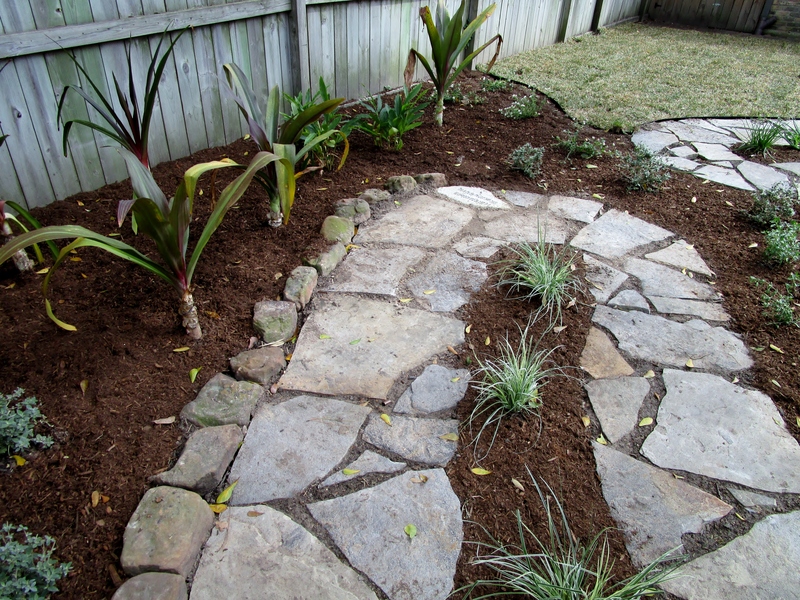 The first design did not have planting beds between the paths but just a simple line of dwarf mondo grass. I had the idea that it could double as a patio that way. 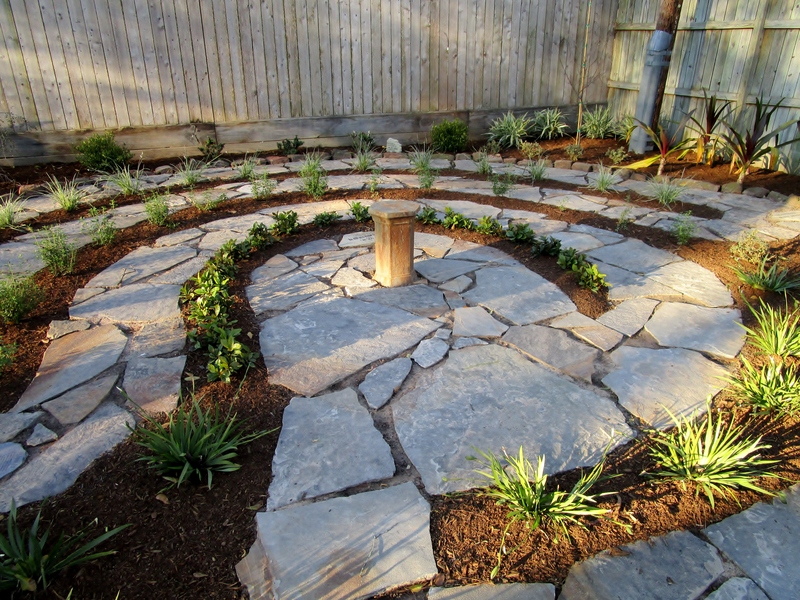 The clients decided that was not the look and feel of the labyrinth they desired. So a second design was done. This one also has a bigger area in the middle so a chair or table could be placed there. I chose plants whose form is naturally low and compact. Starting in the center we have Green Ardisia a very nice slow spreading ground cover. 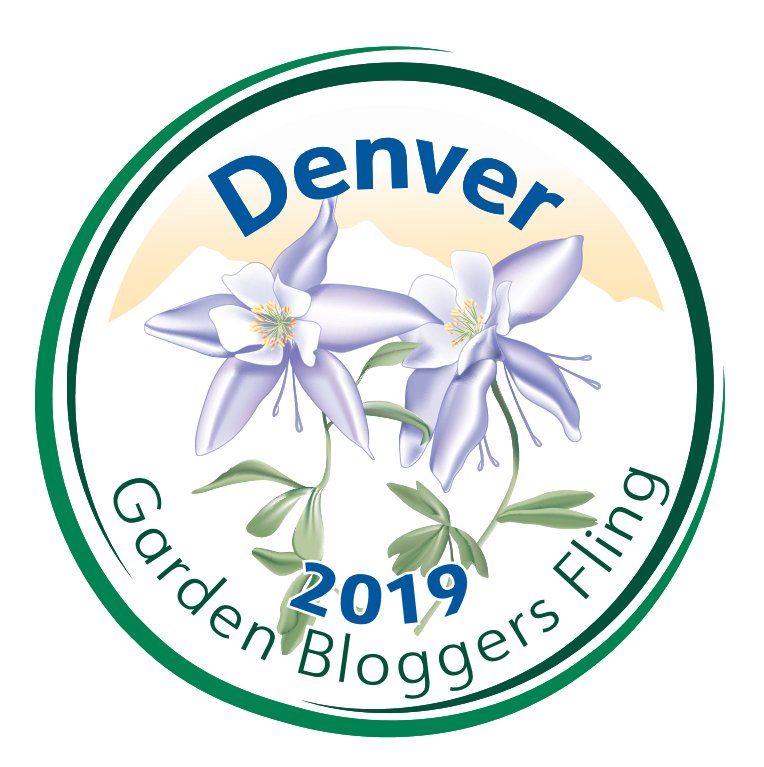 To the north is planted a half ring (or half circuit if you use labyrinth terminology) of Salvia greggii in mixed colors and continuing north a half ring of Variegated Shooting Star Lilies, Anthericum saundersiae (‘Variegata’). The area and first ring to the south has Danny’s Dwarf butterfly iris and the final ring going south is a half circle of bulbine. 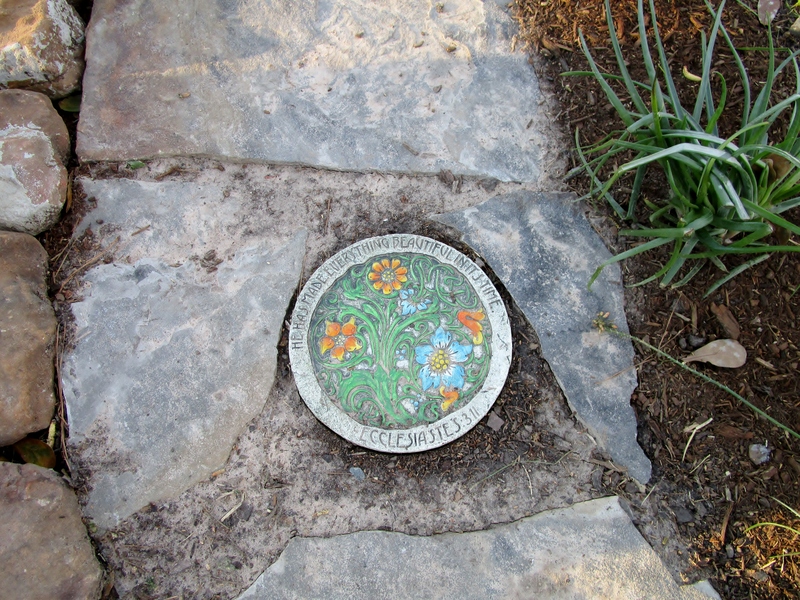 Already the bulbine are blooming and by late spring there should be many other blooms that will attract bees and butterflies : ) Once everything was decided and the install date came we began by stripping out the grass and painted the design on the dirt. Using a central point, here we used a stake, makes creating concentric rings much easier. This helps the installers honor the design and intent. Once the lines are marked we lay the stones in roughly their space. We then come back to backfill and level all of the flagstone. We want a surface the client does not have to think about when they use the labyrinth. 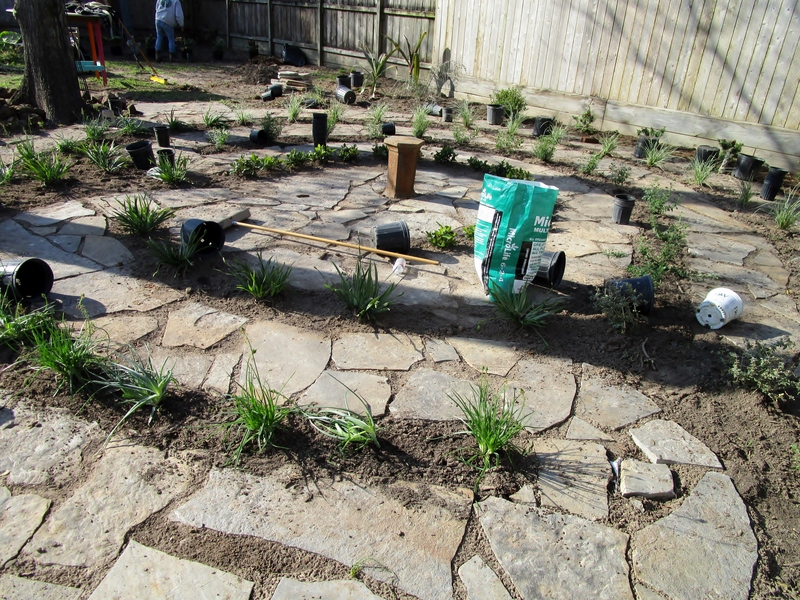 Here the labyrinth is freshly planted. Note in the lower right corner the stone in the curve with space all around. 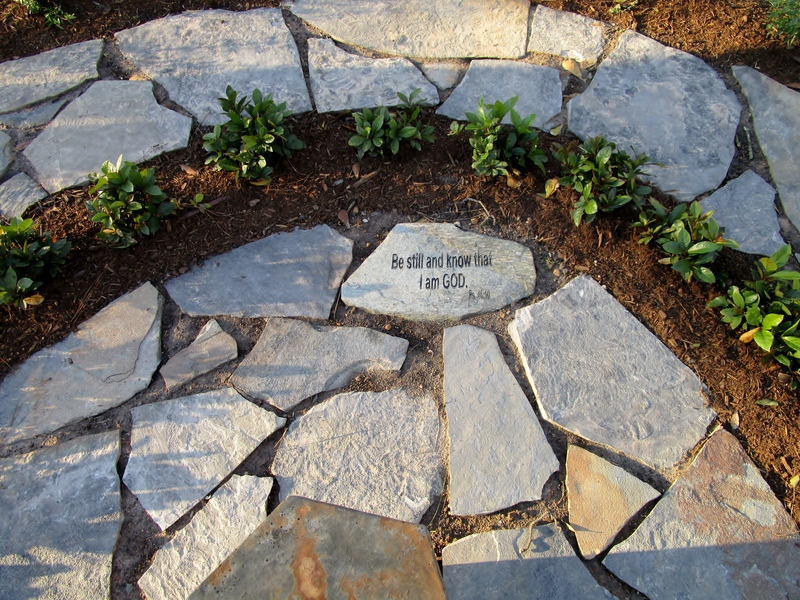 This is just a placeholder until the clients’ stones incised with devotionals come in. They found a wonderful plinth to put in the center of the labyrinth. 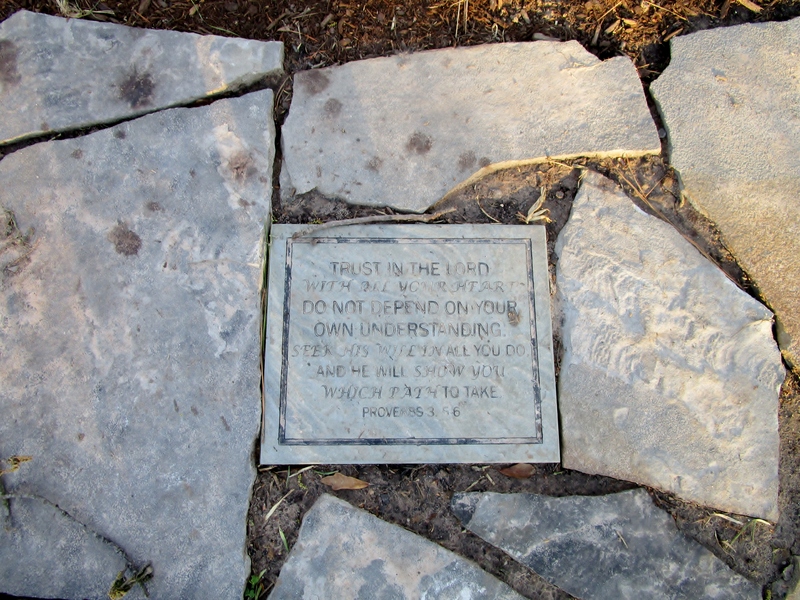 There are also stones with inspirational sayings distributed along the path. The purpose for ancient labyrinths has come down to use via myths. Historians do not actually know the real purpose of them. They appear again in churches and cathedrals of Europe. According to Wikipedia: “In medieval times, labyrinths began to appear on church walls and floors around 1000 C.E.. The most famous medieval labyrinth, with great influence on later practice, was created in Chartres Cathedral.” In doing my research I learned of a group called the Labyrinth Society. Their site is a wealth of information. The society was formed in 2001 and their first project was to help define terms that have been historically associated with labyrinths. 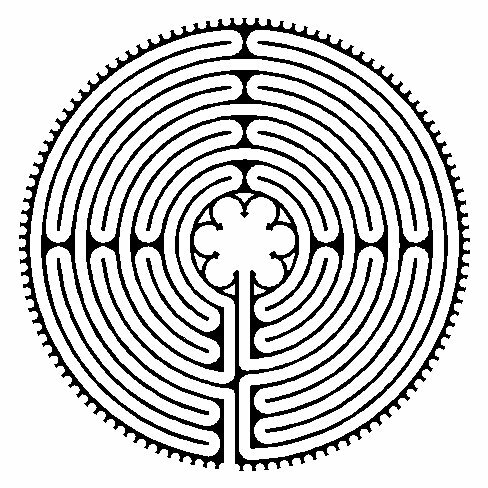 Their definition of a labyrinth is “a single path or unicursal tool for personal, psychological and spiritual transformation.” This is done by walking on a labyrinth or it can be done with a small labyrinths on paper, wood or stone just by tracing the path to the center and back with your finger. Here is a link to a page on the Society’s website were you can download a finger labyrinth. International labyrinth historian, Jeff Saward, estimates that approximately two-thirds of the ancient classical labyrinths are right-handed and two-thirds of the modern classical ones are left-handed. It is thought that labyrinths were used as a method of prayer and communion with God, long before Christian times. Some feel the use of them by the early church is likely because of the cross-like symmetry. In the time of pilgrimages to Jerusalem parishioners could walk the labyrinth as a virtual pilgrimage if they were not able to make an actual one. 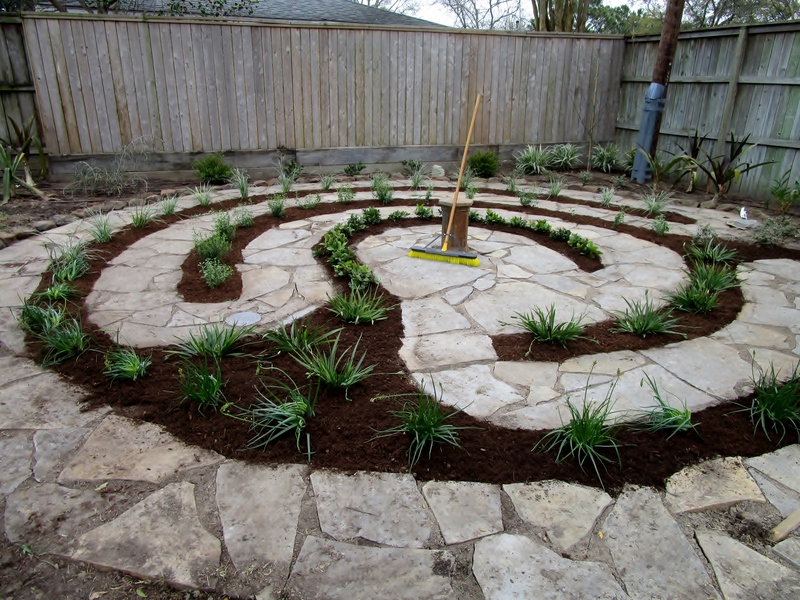 We made the entrance to this labyrinth on the western side with a path from the edge of the patio. It will be easy to reach as you come straight out the back door and the path is right in front of you. The entrance paths to Medieval labyrinths were on the west so as you entered you would be facing east to the rising sun, symbolic for beginning your journey facing the risen Son. In addition to being representational of a pilgrimage it was also a kind of walking (body) prayer leading you to God or a God consciousness as you reach the center. A close-up of the center, with the simple table or plinth. 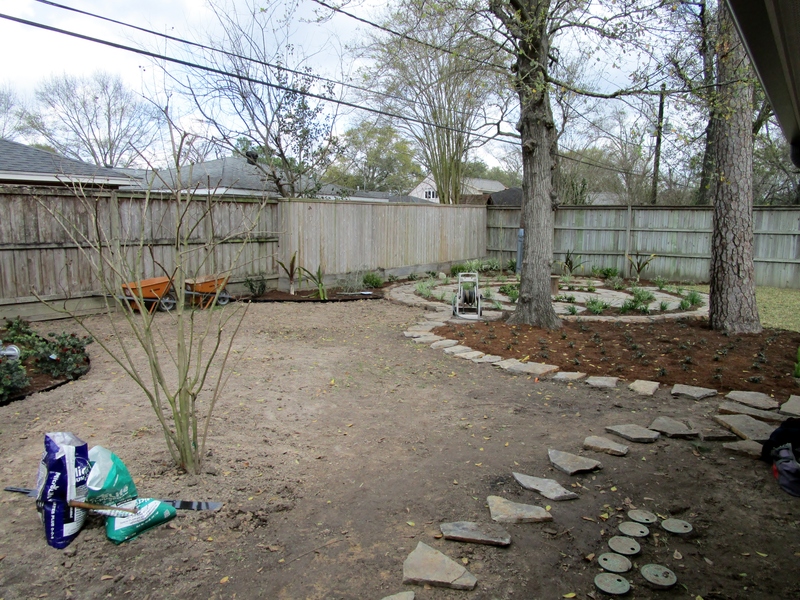 The surrounding plants will fill in the space. Because we used drip tubing in these beds there will be no overspray on the stones (not that the stones would mind) but early-morning user of the labyrinth will appreciate this. 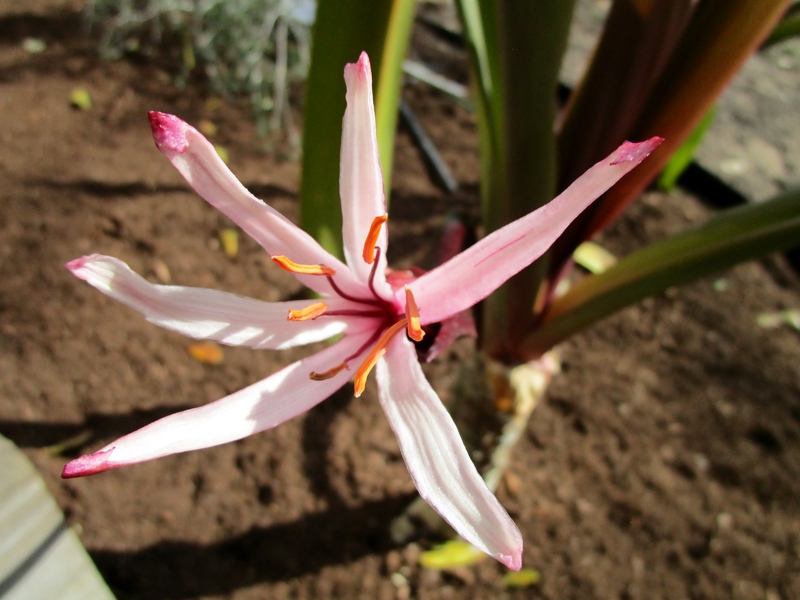 The fan-shaped plants above with burgundy tinged leaves are Splendens crimum lilies, Crinum procerum ‘Splendens’. They bloom delicate pink flowers in early spring. “Generally there are three stages to the walk: releasing on the way in, receiving in the center and returning when you follow the return path back out of the labyrinth. Symbolically, and sometimes actually, you are taking back out into the world that which you have received…..There are many ways to describe a labyrinth. It is a path of prayer, a walking meditation, a crucible of change, a watering hole for the spirit and a mirror of the soul.” – from Guidelines for Walking the Labyrinth (Veriditas.org) There are a few stone still coming in the post. The stick below is marking where one will go. We will return to fit them in as soon as they arrive. 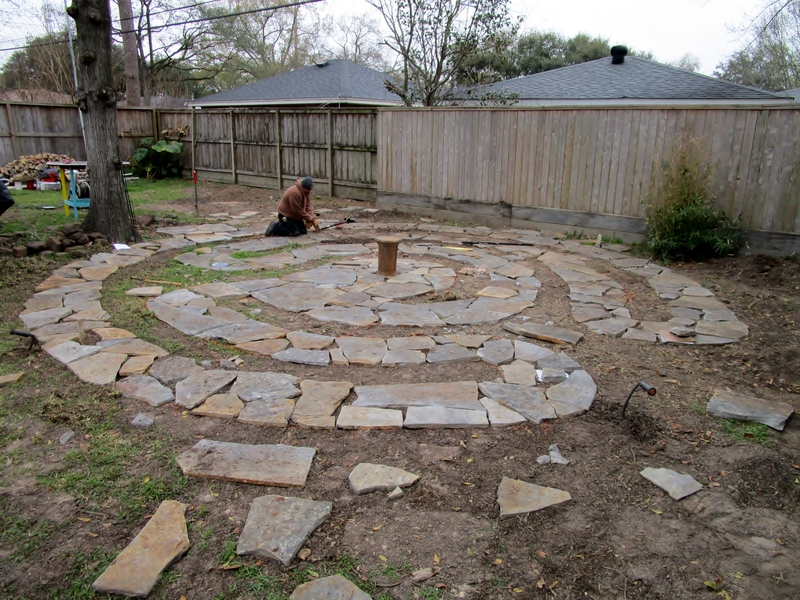 While we did not want to mar the naturalness of the shape and materials we did ring the south side of the labyrinth with steel edging (just visible on the right) to help keep the crisp line as well as making keeping the St. Augustine out of the labyrinth (no pun intended). Here you note that the patio is larger and the path is now tight to the house. The space is more cohesive and more functional. 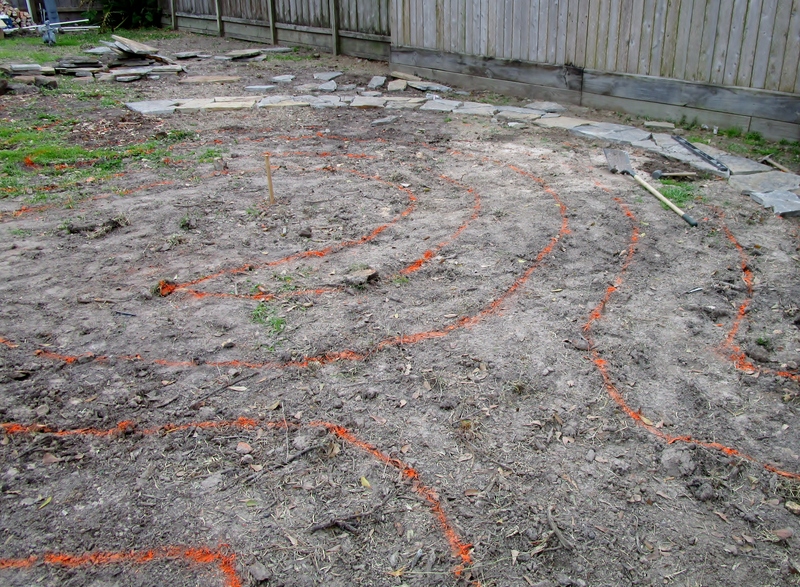 I hope to get feedback from the couple as they use their labyrinth. 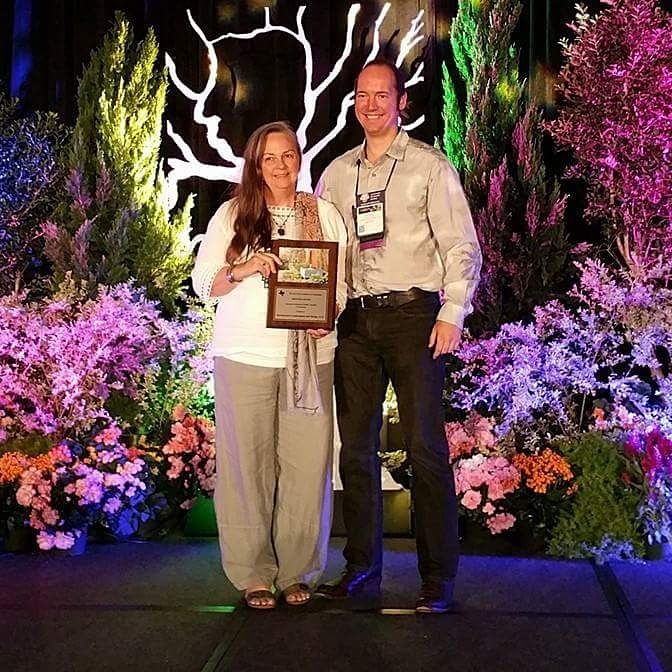 I found that over the last 10 years, as labyrinths have become more popular in concept and presence around the world, research is being done on the physiological benefits of walking a labyrinth. There seems to be a positive effect on children and adults with learning difficulties, at least temporarily improving there cognitive abilities as they finish their labyrinth walk. 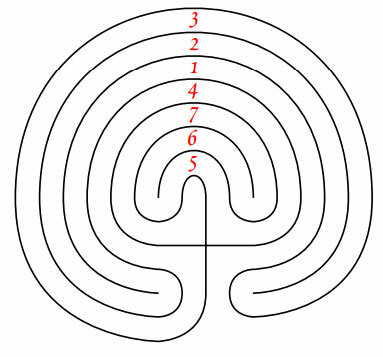 These studies use seven circuit labyrinths which have many left and right turns. It is believed that the fluid in the brain crossed back and forth across the middle line of the brain helping balance and integrate the left and right sides and this helps improve both logical and artistic activities. There seems to be many more benefits and we are starting to see labyrinths installed in rehabilitation centers, hospitals and other care facilities. Other benefits I read about are better body balance, a feeling of calm and lower blood pressure. They are even finding benefits for Alzheimer patients. I am wondering where I could fit a labyrinth here at Ravenscourt Gardens. I found a couple of great PDF articles on the benefits of walking a labyrinth that you might find interesting too. One is Labyrinths: Yesterday, Today and Tomorrow–Implications for Education by Barbara Michels, Debra Maxwell, & Ching-Wen Chang, Missouri State University. 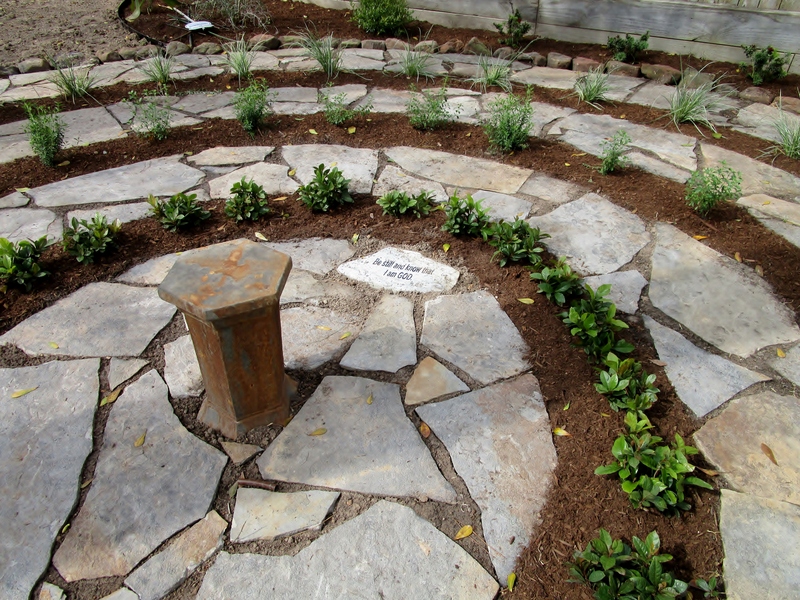 And 101 Ways to Use a Labyrinth, Lessons for living. 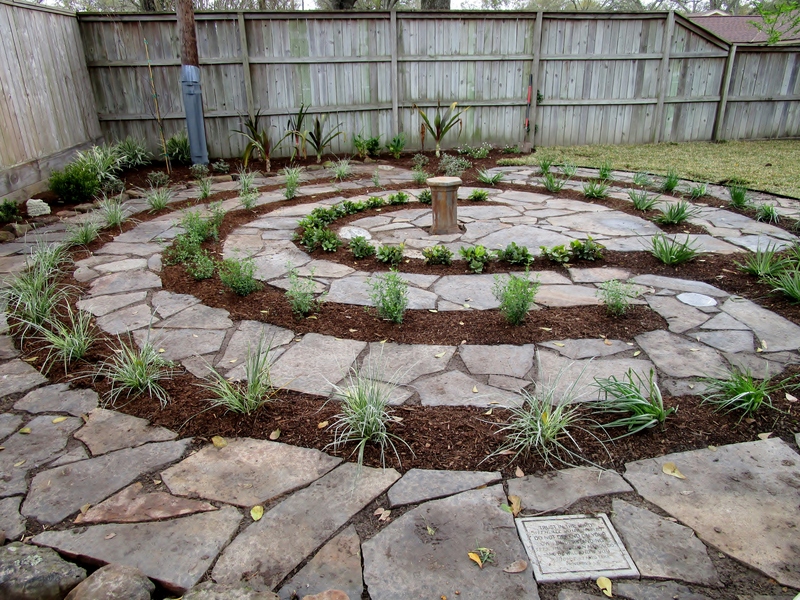 The Design of the Chartres Labyrinth, From the site Labyrinth Enterprises, LLC, they have several patterns on this site. It is a lot to ponder…such a long history! I feel drawn to labyrinths, I know I could use one : ) I will check out the link, thank you so much. Outstanding! I really like what you’ve done here. One of our local hospitals has a labyrinth. There is also one at my local park but using one as part of a private garden is just such a great idea. Thank you! I was so blessed to be part of it. I would love to have one in the Heights! If only I had more time to put that forward as a project some where near us. There are plenty of parks that could hold one, like Monte Beach. Loved this post and all of the information about labyrinths! I’d no idea about the benefits for folks with cognitive impairments. I’m always blown away by your work and how you can take the desires of your clients, the reality of the space into consideration and come up with something beautiful. Thank you Peter! It is a “labor” of love. It can be very challenging, like in this project but so satisfying when it is complete. I hadn’t heard all this information on labyrinths, fascinating! 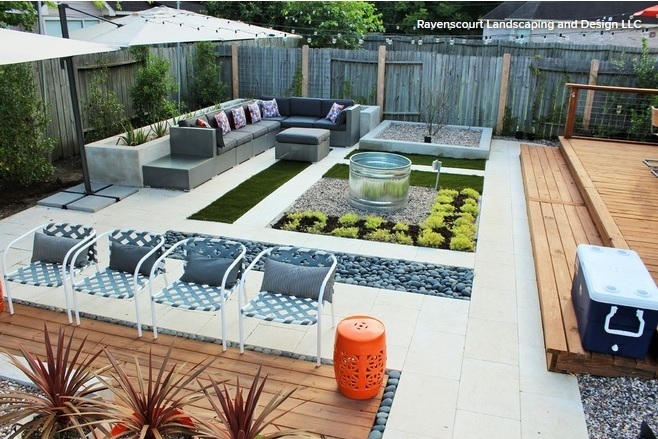 The transformations in that backyard make it much more useable and interesting. Children would probably really like a labyrinth too. I think this is a great addition to a garden, especially in service of getting rid of some lawn and adding something of value that will get people outside. Nice work! Thank you Pam…it was a fun project. 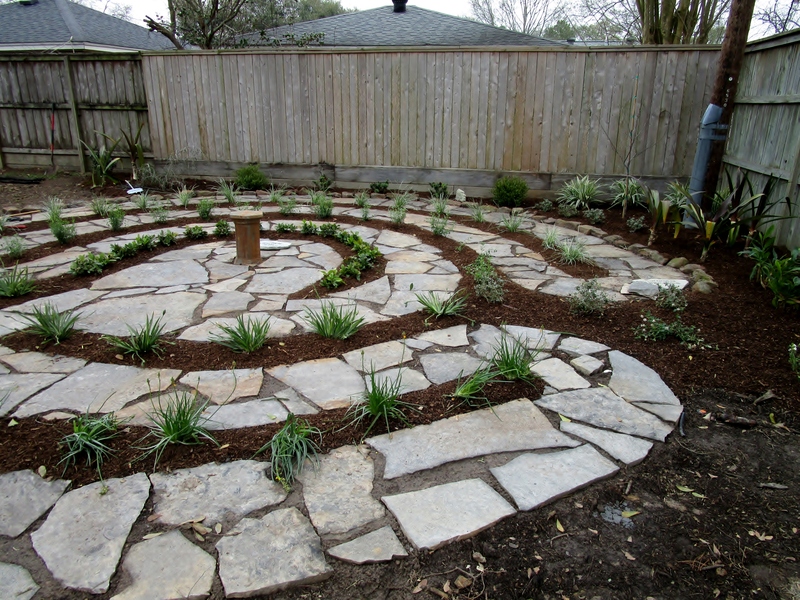 I would like to more labyrinth patio’s, such a interesting pattern. 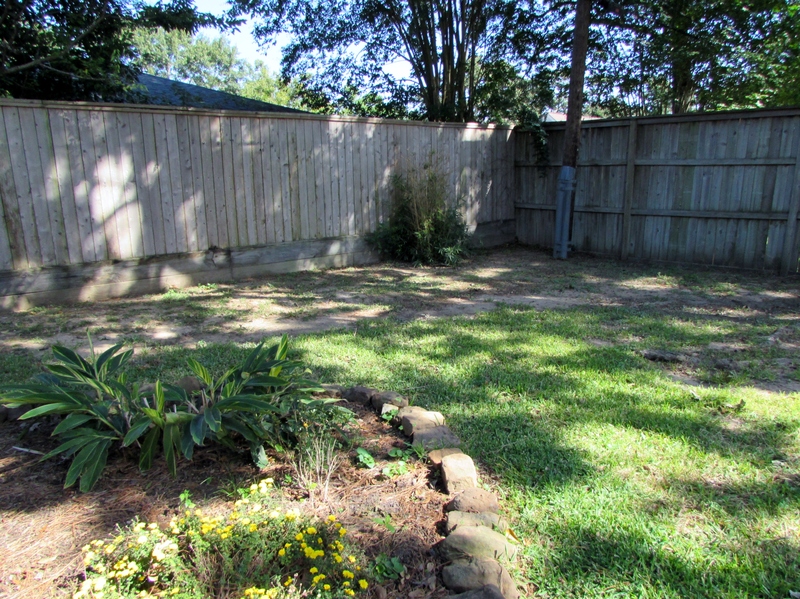 If only yards took care of themselves…sigh.